If you believe what is up on Wikipedia – and let's face it, you've got to be pretty desperate to believe everything you find there – there are six professional symphony orchestras in China. The oldest of these is the Shanghai Symphony which dates back to 1956, although its roots are in an orchestra which was founded back in 1922. Of the others, only one is more than 50 years old, and that's the Guangzhou Symphony which was founded in 1957. According to www.chinaculture.org "The orchestral piece New Raiment of Rainbow and Feather Dance, composed by Xiao Youmei in 1923…is regarded as the original Chinese symphonic music", and most academic research has similarly identified the first western-style orchestral activity in China to date from the 1920s. With the growth in orchestral activity has come what can only be described as an explosion in manufacturing of western-style musical instruments. According to the China Musicians' Association, in 2003 there were 87 factories in China making western musical instruments. By 2006 that figure had grown to 142 and they produced between them 370,000 pianos, 1,000,000 violins and, believe it or not, 6,000,000 guitars. Today, no country produces more pianos, violins or guitars than China. On top of that, as the New York Times' reported from Beijing; "The government has a complex bordering on mania when it comes to building concert halls. Some are white elephants, constructed hastily with little attention to programming or economic viability. That same news item, published under the headline "Classical Music Looks to China With Hope", suggested that; "China at its best produces virtuosos who can compete worldwide". Indeed, much is made of the brilliant young virtuosi coming out of China and more than one commentator who, under normal circumstances, might exercise restraint and reserve when peering into the future, has gushed about China as the "new force in classical music". Certainly when it comes to numbers, China is a force to be reckoned with. There are, according to the CMA, an estimated 30 million piano students and 10 million violin students in China, and the country's leading music conservatories attract nearly 200,000 students a year, 100 times more than they were attracting in the 1980s. But while such vast numbers will inevitably throw up a crop of great solo virtuosi, there remains many thousand excellent, possibly outstanding players who, lacking the charisma or marketability to become clones of such classical music superstars as Lang Lang and Yundi, nevertheless wish to pursue a career in music. For them, especially the string and wind players, the obvious choice is to join an orchestra. 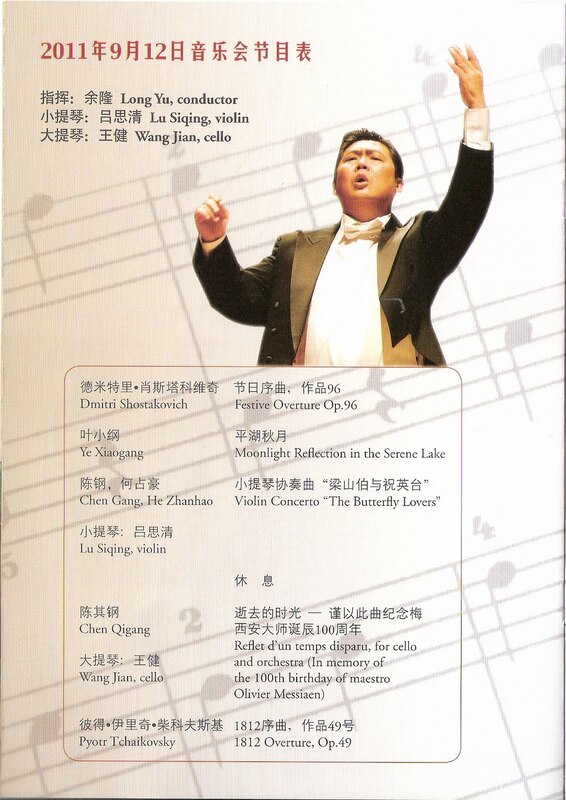 It amused me when the Malaysian Philharmonic Orchestra was coming under criticism for "buying in foreigners", that nobody thought to look at the sheer number of orchestral players from mainland China who have inveigled themselves into most of the symphony orchestras of the world. Frankly, without Chinese musicians, I suspect that some orchestras would be facing a very serious manpower problem indeed. That so many Chinese orchestral players have found seats in orchestras in Europe, America, Australia, Africa and, of course, Asia, is possibly as much a reflection on the parlous state of orchestral life back home as a desire to travel overseas. And it is to keep these native orchestral players at home that the last 20 years has witnessed a three-fold increase in the number of professional orchestras in China. Sadly, to quote again from the New York Times, China "has no symphony orchestra that ranks with a major orchestra in the United States". I have been putting that observation to the test this week, listening to the second oldest of the Chinese orchestras, the Guangzhou Symphony. These were closed door, invitation only concerts, held as a gesture of thanks for Singaporean financial and intellectual support in a new development in Guangzhou city. I suspect that a majority of the audience may not have been habitual concert-goers, but they clearly loved what they heard and the enthusiastic response they gave was unquestionably genuine. I have to say, from my point of view, these were very impressive shows and I was glad I was in a position to attend them. True, conductor Long Yu decided to go for the kill by giving a phenomenally fast performance of Shostakovich's Festive Overture in which there was no hope that any of the music's detail would emerge from the manic rush of notes, but even I was caught up in the excitement of it all and cheered as loudly as the rest at the end. Long pushed the boat out even more with the 1812 which ended Monday's concert, while his colleague, Lin Daye, who conducted Tuesday's, was a little – but not much – more discreet with Tchaikovsky 5. We had almost inevitably, the Butterfly Lovers' Concerto on Monday, with Lu Siqing hamming up the melodrama embarrassingly, but unquestionably delivering this corny music with a panache which made it easy to overlook the sheer banality of it all. It was in the two other works that both the strengths and the weaknesses of the orchestra revealed themselves. I have a belief that the Chinese are not team players. They do make excellent soloists, but they have neither the interest nor the sensitivity to blend in with others. That's a shocking and disgraceful generalisation; but that's what I think, and nothing I heard here prompted me to change my mind. This soon became obvious in Ye Xiaogang's Moonlight Reflection in the Serene Lake. Instead of the smooth, blended, reflective, almost impressionistic tone colours I've heard non-Chinese orchestras produce, the Guangzhou Symphony blurted it out in big, indigestible chunks, no serenity or reflection here, just a demonstration of technical competence. And for all cellist Wang Jian did to evoke some subtlety in Chen Qigang's homage to his teacher Messiaen, Reflet d'un temps disparu, the orchestra were really not going to let him steal their thunder. Balance was never an issue; sensitive soloist/orchestral relations were. If the Guangzhou Symphony is typical of Chinese orchestras, it has a level of technical excellence which puts many orchestras in the west to shame. I can't imagine many violin or cello sections offering up quite such collective virtuosity as these lot did in the Shostakovich, and few percussionists have evoked the clamour of cathedral bells quite so vividly as did the Guangzhou player in 1812. But these are players who like everything painted in garishly bright prime colours; brilliant reds, dazzling blues, eye-catching yellows. Not for them pastel shades or delicate hues. And it is that inability to subjugate themselves to the service of the music that bars Chinese orchestras from rising to the very top rank. They are made up of brilliant, world-class individual players, but collectively they are second-rate orchestral musicians. I was present in both Monday and Tuesday night concerts. And I respectivelly agree most of the post. But not on this one..
"We had almost inevitably, the Yellow River Concerto on Monday, with Lu Siqing hamming up the melodrama embarrassingly, but unquestionably delivering this corny music with a panache which made it easy to overlook the sheer banality of it all." Music is quite a subjective thing, some time nationalism. Calling the Butterfly Lovers' Concerto "corny" to Chinese audience is like telling the English "Pomp and Circumstance" as noisy or the Viennese "Radetzky March" as lousy. 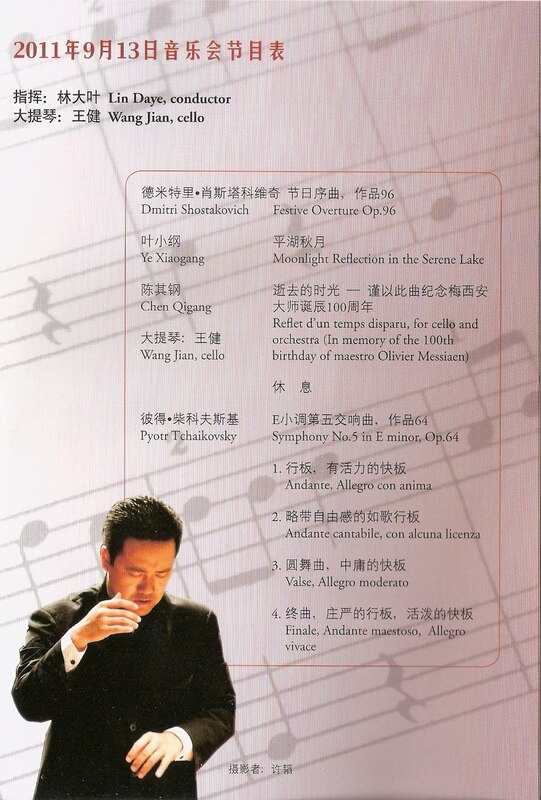 My post refers to the Butterfly Lovers Concerto, not to the Yellow River Concerto! You identify the problem, though. For this Concerto to make any sense at all you must know the story - otherwise it's just a rambling succession of predicatble chords. No music critic can honestly label it a great work for this very reason, whether they write for Gramophone or for the North Tonawanda Daily! And if anybody ever describes any musical work as lousy, they deserve to be shot! Ah! Yes Dr Marc, I was reading your review on the Straits Times and was wondering why was a Violinist playing the Yellow River Piano Concerto! Now I wonder how many of your followers appeciated the North Tonawanda reference? Mighty few, I imagine! As an English, I would be the first to admit that the Pomp and Circumstance marches are indeed on the noisy side. Stirring stuff, makes you feel good, but that's about as far as it goes. And hugely popular. Even Elgar, reputedly, got a bit sick of their popularity. Certainly he wrote much better stuff than that. I have not met many Austrians who consider Johann Strauss marches to be the greatest works to have come from their country (ok, maybe in a bigger sample the pattern may be different). But they are great fun, and very popular. And Butterfly Lovers or Yellow River ? Having known and liked both works for many years, and also performed "in the band" for both, I would agree with Vincent's choice of peers. Someone once described the Yellow River concerto as "Liszt with a lobotomy"; that seems a bit harsh, but would anyone claim that it does not have quite a bit of pastiche to it ? Somewhere between Warsaw Concerto and Assault on Beautiful Gorky ?